(NC) This holiday is all about spending time with family and friends. But that can be a tough thing to do if you’re stuck in the kitchen. This Thanksgiving, entertaining expert Pay Chen is sharing her tips on getting you out from in front of the stove and into a comfortable seat at the dining room table. Your freezer is your friend. From casseroles to gravy and cranberry sauce, Chen suggests pre-making dishes days ahead and popping them in the freezer. Simply defrost them in the fridge one to two days before Thanksgiving and reheat on the stove or in the oven, slow cooker or microwave. The freezer can also be help on the big day itself - if you get handed a great bottle of wine that you want to open that evening, cool off the bottle fast by wrapping it in a damp dish towel or paper towel and sticking it in the freezer for 10 to 15 minutes. Just don’t forget to take it out on time or the bottle may explode. Pre-cut your vegetables. Chopping vegetables in advance will save you a lot of time on the big day, says Chen. If you’re really strapped for time, grocery stores also offer pre-cut and pre-washed vegetables, although these are often at a higher price point. Consider a pre-made dessert. Dessert is the finish line of the meal, and there’s nothing better than a little assist to bring it home. “If you’re running low on time, consider picking up a quick and delicious frozen dessert,” says Chen. “Just make sure it’s a top-quality option that matches the made-from-scratch spirit of the meal.” Try the new collection of frozen treats from the Ontario apple farm Chudleigh’s, now available in the freezer section of most Ontario grocery stores. 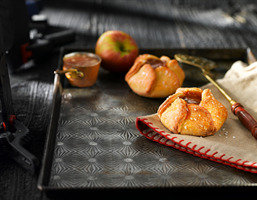 The farm’s new bake-at-home collection includes their signature Apple Blossoms and other scratch-made, fresh-from-frozen treats that you can reheat in the oven or microwave in just minutes.